your customers, markets and locations. And create your custom demographic map today! "How does the location of targeted people and households affect my business?" 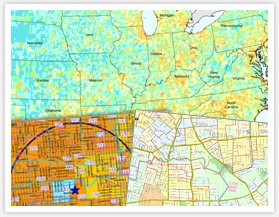 Create custom maps with demographic data to make informed business decisions. Carrier Route, Census Tract level and more! design sales territories, evaluate store performance and select sites. the best data for your business needs. 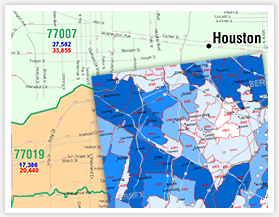 Custom maps display demographic data on any custom area in the USA. information you need to determine the best site location for your business.